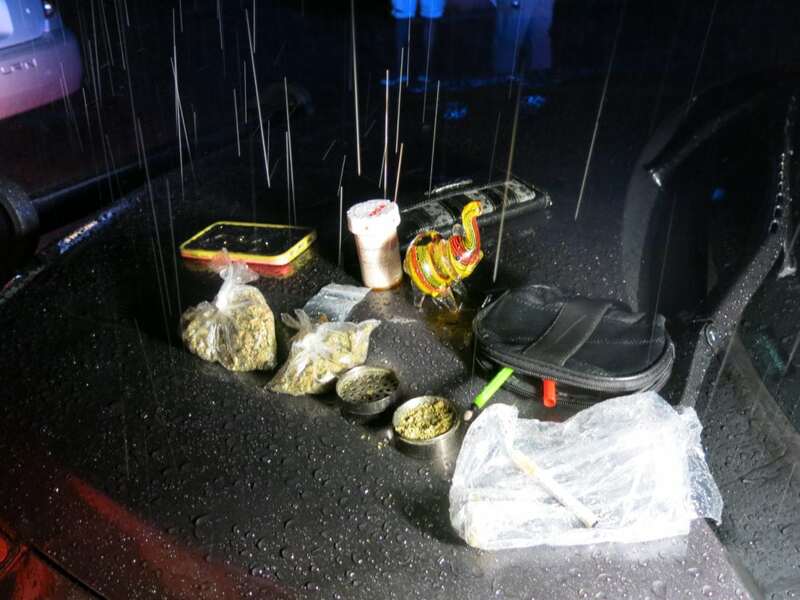 Times Observer photo by Stacey Gross Deputies of the Warren County Sheriff’s Office detained one person from a car that was stopped during roving patrols while other deputies search belongings of the car’s occupants. You hear about them all the time. “DUI patrols this weekend,” will be the rumors going through town. “Checkpoints will be here or there.” But what’s it actually like to work a roving DUI patrol on the part of officers? I don’t know, exactly, because I’m not an officer. I’m some weird chick that Chief of the Youngsville Borough Police let ride in his car Friday night as he and two other officers from Youngsville patrolled the area looking for people driving under the influence. Though there was plenty going on this weekend, the night started off slow. That’s to be expected, considering that bars don’t start shutting down until 2 a.m. and I jumped in on the evening’s work around 11 p.m. Things at most bars were just getting started, We did a lot of cruising, and a lot of watching. Immediately upon setting out from the borough offices, we swung through the Country Fair on Route 6 in Pittsfield because a car that officers had been told may have been involved in a recent crime in town was seen. 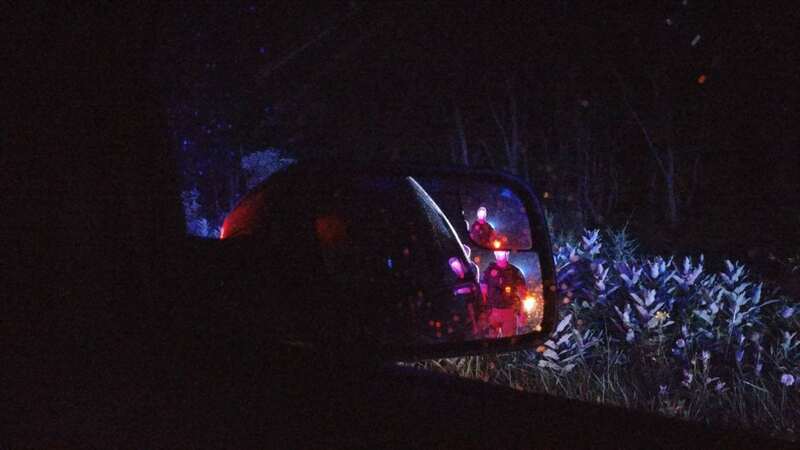 Times Observer photo by Stacey Gross This was the view for many motorists in Warren County this past weekend as area law enforcement undertook a roving DUI patrol. Patrols went as far as Garland, and spent some time sitting at various spots throughout town, with traffic violations being the order of the day. While responding as backup to the first DUI of the evening, another call came in about a white SUV swerving all over the road headed into Pittsfield. That stop turned out to be nothing more than an out-of-town driver struggling with an unruly GPS. The DUI wound up being an actual DUI. When someone is arrested for DUI in the county, said Mineweaser, they are taken to the Warren County Jail for a breathalyzer test. The Intoxilyzer purchased for county law enforcement use is at the Warren County Sheriff’s Office, so the person being tested was transported there. Once they got there, there was a 20 minute wait. Mineweaser explained that it is part of the protocol for this particular machine, which is delicately calibrated to provide the most accurate results possible. It provides an alternative to chemical testing for drugs and alcohol using blood. Times observer photo by Stacey Gross One stop yielded a large amount of controlled substances, including suboxone and a large quantity of mixed pills, paraphernalia, and a large amount of marijuana. Upon completion of the Intoxylizer test, the person being tested was then transported back to the borough offices, where Mineweaser said, when he’s the one making arrests, he’ll mirandize and interview them before turning them over to a party who’s willing to accept responsibility for their well-being for the next 12 hours. By around 1 a.m. things had started to pick up. People filled the little town of Youngsville, which has a total of five establishments that serve alcohol. The amount of people walking at 12, 1, 2, and 3 a.m. in Youngsvile was astounding to me. I can’t imagine where they could be going or why. Then again, I’m usually pretty pumped to get into bed by 9 p.m.
Mineweaser talked at great length about the issues that law enforcement officers in rural areas face, not the least of which includes dual relationships. In such a small area and with such specific problems in that area, Mineweaser said he can expect that he’ll be running into a lot of the same people many times over. That demands an ability to develop any rapport possible with residents. The goal for him has always been to work with people while still following through on the duties that come with the job. 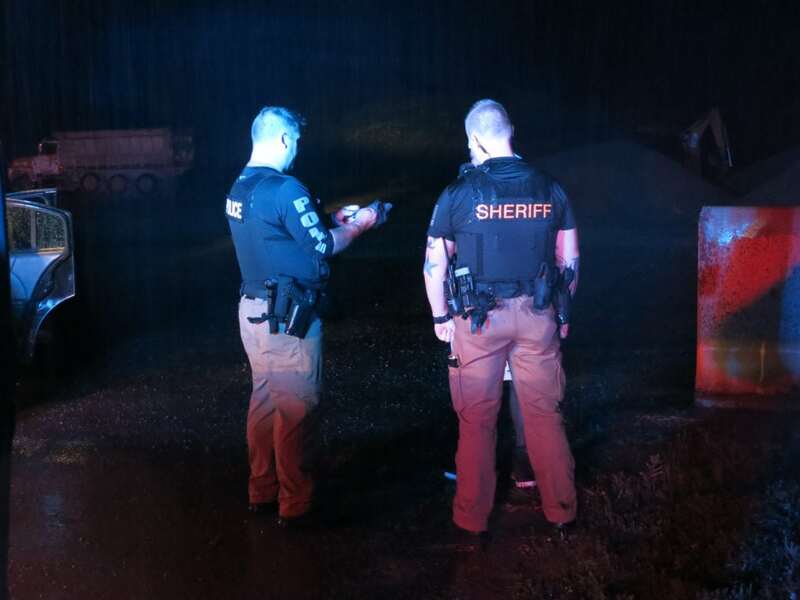 By 1:30, reports of a car pulled over in Starbrick that was being searched were peppering the radio, and Mineweaser responded to assist deputies of the Warren County Sheriff’s Office, who’d stopped the car after seeing the driver swerve multiple times. In the rain, officers filled the little road where the car had stopped. Three suspects were separated, with one in the back seat and the other two across the road from one another. Deputies interviewed one man, while a woman waited on the other side. On the hood of the vehicle was a collection of several items that would be earning their owner charges come daylight. The deputy inspecting the haul wore cloves to protect himself should any of the substances turn out to be dangerous. Fentanyl, for instance, can be absorbed through the skin and even very small amounts can cause dangerous overdose and reaction symptoms. Youngsville officers remained on the road until 3 a.m. Friday before packing it in and calling it a night. On the way back to the borough offices from the search of the vehicle by sheriff’s deputies, Mineweaser expressed frustration over the fact that such patrols are necessary at all. 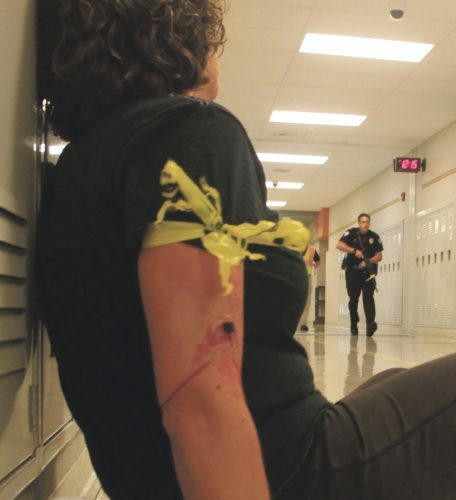 While every officer, just like every person, feels differently about the drug and alcohol issues that underlay a significant portion of their daily work, Mineweaser thinks most can agree it’s hard to understand how to police the issue that keeps people – often people the officers who arrest them know personally to have good hearts and huge potential for good – make the bad choices that bring them into the hands of law enforcement. According to the Pennsylvania DUI Association, law enforcement across the state will be ramping up impaired driving patrols through Sept. 3 in anticipation of spikes during Labor Day weekend. The National Highway Transportation Safety Administration estimates that around 10,000 people died due to alcohol or drug-related crashes in 2017 in the USA. 1,137 of those were Pennsylvania DUI fatalities. The number of DUIs during peak drinking holidays in the state continues to rise, the Pa. DUI Association reports. That is why, said Mineweaser, police in Warren County will continue to patrol during high-DUI times in the county. For him, the issue is personal. Early in his career he was called back into service just as he was about to end a shift to respond to the scene of a DUI crash. “It was bad,” he said. The driver had been a sheriff’s deputy and a man Mineweaser said he’d considered a friend for many years. Walking up to the accident, he said he realized who it was and what had happened slowly. His reaction was not good, and he struggled to get through the remainder of the event, which involved notifying the man’s wife what had happened and trying to sort out whether or not, in the days that followed, he had the stomach for this kind of work. In the end, he said another officer who had some years on him reminded him that yes, he had to deal with some difficult challenges in responding to the scene, but that in his capacity as an officer he’d also had the opportunity to provide comfort to the family of the deceased. He took several weeks to decide whether or not he’d be able to come back to the work, Mineweaser said, but he eventually did. Ideally, said Mineweaser, there would be no one driving under the influence to prosecute. But, he said until that’s the case, law enforcement will continue to stop drivers who pose a threat to those around them by driving under the influence.